So much for universities being hotbeds of left-wing rabble-rousing – it looks like Corporate Canada now calls the shots on campuses across Ontario. For years, the signs of growing corporate influence on Ontario campuses have been hard to miss: from exploding tuition fees to the rise of precarious contract instructors to an increasingly hardball approach to labour relations, right on up to industry partnerships that compromise academic freedom. “Today’s universities have become more commercial in orientation, more business-like in practice and more corporate in self-presentation,” notes a recent book from the Canadian Centre for Policy Alternatives. Shedding new light on the growth of corporate influence on Ontario university campuses, a new analysis by PressProgress reveals corporate leaders currently hold more than one-third of all seats on the boards of governors at Ontario’s 18 biggest universities. 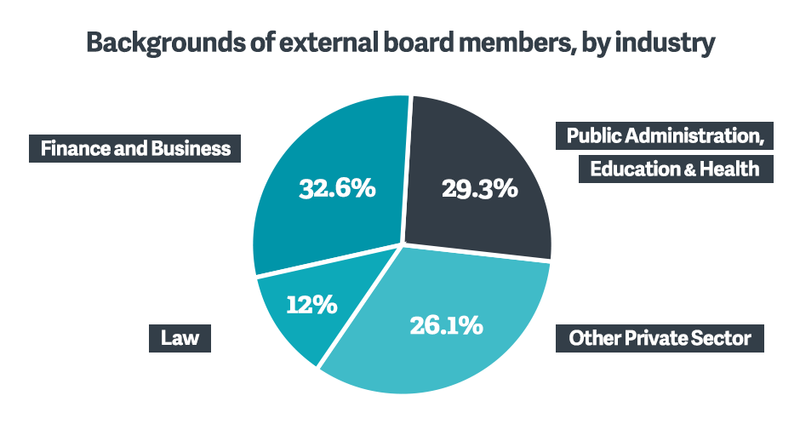 External members on boards with backgrounds as corporate executives or directors now outnumber members drawn from local academic communities, including faculty, staff and students. In total, 33.5% of all seats at Ontario universities are held by Ontario’s captains of industry while other external members hold 28.1% of all seats. Rounding things out, board members drawn from students, faculty, staff and Senate members hold 30.3% of all seats while ex officio presidents and chancellors hold 6.9% of all seats. University governance structures vary in shape and size from university to university. Some are bicameral, incorporating a Board of Governors responsible for making strategic decisions on the finances and operations of the university as well as a Senate, overseeing academic matters. In all, PressProgress examined the backgrounds of more than 500 board members at universities across Ontario, including over 300 external members recruited from the “community-at-large” elected or appointed by university boards and Ontario’s provincial government. In total, more than half of all external members named to university boards (54.4%) had backgrounds as either corporate executives or directors while seven-in-10 (70.4%) were recruited from the private sector. Broken down by industry, one-quarter of appointees have backgrounds in finance (25.5%), followed by law (12.9%) and other private-sector industries such as business services (7.4%) hi-tech (4.3%), manufacturing (4%) and natural resources (3.1%). Only 29.3% had public sector backgrounds, including public administration (19%), health (6.7%) or education (3.7%). Out of Ontario’s 18 biggest universities, PressProgress’ analysis shows Queen’s University in Kingston has the most external members with corporate backgrounds. 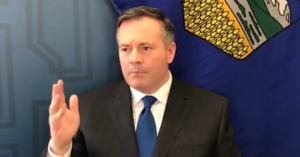 Queen’s, whose board draws on the experience of seasoned executives and directors from companies like SNC Lavalin, Bank of Montreal, Telus and Morneau Sheppel, has appointed or elected 81.3% of its external members from Corporate Canada. Raymond is Chief Investment Officer at Alignvest Investment Management and previously served as an executive at Goldman Sachs. 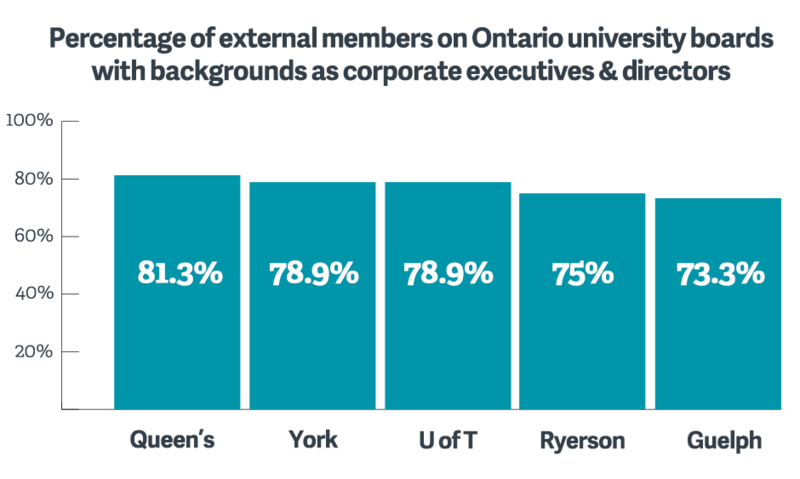 Following Queen’s, York University (78.9%), the University of Toronto (78.9%), Ryerson University (75%) and Guelph University (73.3%) all saw three-quarters or more of their external members recruited from Corporate Canada. Yet the share of votes placed in the hands of external board members drawn from corporate backgrounds would give this bloc extraordinary influence over the business and strategic direction of Ontario’s publicly-funded universities. 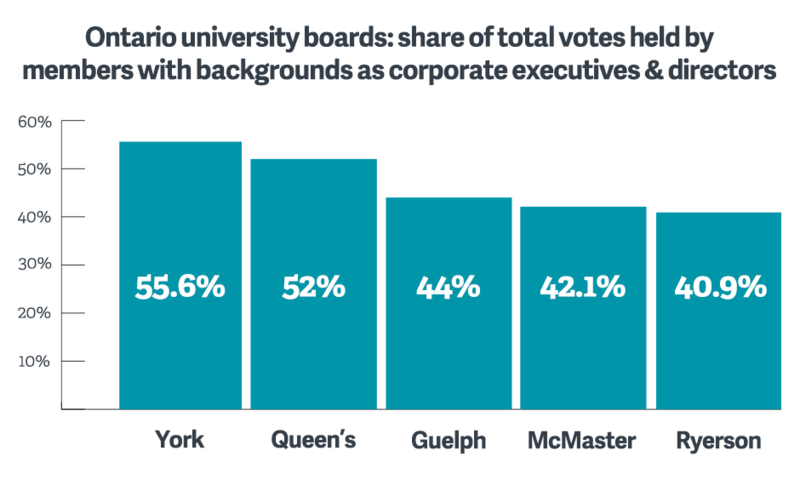 At both York University (55.6%) and Queen’s (52%), external members with corporate backgrounds now hold the majority of all votes on their boards. York and Queen’s are followed by Guelph (44%), McMaster (42.1%) and Ryerson (40.9%). York University did not respond to a request for comment from PressProgress. Local dynamics can also shape the composition of university boards. The University of Waterloo, located at the centre of a major hi-tech “supercluster,” also has the greatest number of university board members drawn from the tech sector, including one of the board’s vice-chairs – a former CEO of local tech giant and BlackBerry-maker Research in Motion. On the other end of the spectrum, only 3.8% of the board members at North Bay’s Nipissing University have backgrounds as corporate executives or directors while 42.9% are drawn from backgrounds in public administration, education and health, though Nipissing does stand out as an outlier. 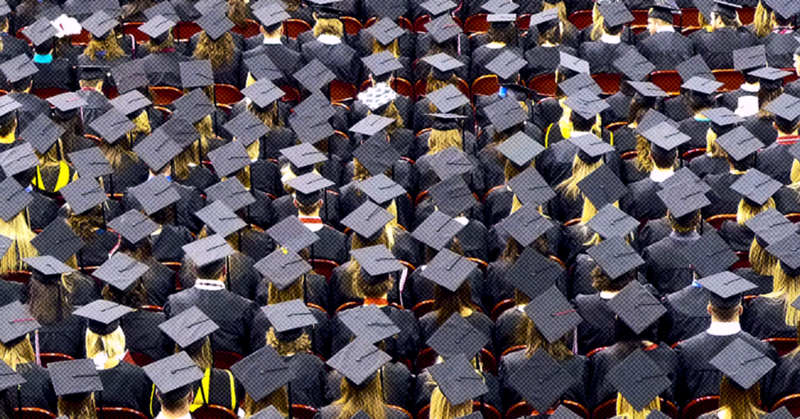 While some universities, like Ryerson, suggest boards with private sector experience bring specialized “skills, competences and experience” to the table, that can also make public universities less accountable to the public interest. Jason Kenney thought he could weasel his way out of voting on a bill designed to protect women from harassment by aggressive anti-abortion activists, but it’s not quite going as planned.